Questions/comments? Email us at sat_physics@physics.illinois.edu. Talk slides: When available, the slides from the professors' talks can be found linked from the individual events below. View the 2018 series poster. Saturday Physics for Everyone: When Stars Attack! Radioactive evidence for a near-Earth supernova explosion. The most massive stars are the celebrities of the cosmos: they are very rare, but live extravagantly and die in spectacular and violent supernova explosions. While these events are awesome to observe, they can take a sinister shade when they occur closer to home, because an explosion inside a certain "minimum safe distance" would pose a grave threat to Earthlings. We will discuss these cosmic insults to life and present recent evidence that a star exploded near the Earth about 3 million years ago. Radioactive iron atoms have been found in ancient samples of deep-ocean material found around the globe, and also on the Moon. These unique atoms are tiny, telltale samples of debris from the supernova explosion. Thus, for the first time we can use sea sediments and lunar cores as telescopes, probing the nuclear fires that power exploding stars. Furthermore, an explosion so close to Earth was probably a "near miss," which emitted intense and possibly harmful radiation. Professor Donna Cox is a nationally and internationally recognized pioneer in scientific visualization for public outreach, education, and cinema. Professor Cox and her collaborators have inspired millions with cinematic virtual tours through astrophysics, earth sciences, engineering, and other data domains. Their work is shared through venues such as international digital-dome museum shows, high-definition documentary television programs, and IMAX movies. For example, she was the art director for the IMAX film A Beautiful Planet. In her presentation, Professor Cox will give us a small window into how visualization enhances communication between science and the arts. A FREE SCREENING of Professor Cox film, Seeing the Beginning of Time: Tuesday Oct 24 7 PM at NCSA, Room 1122, 1205 West Clark Street in Urbana, followed by a Q&A with a panel of experts. View Professor Cox's presentation slides. We are in the midst of a great revolution in miniaturized electronics, with nanoscale electronic elements enabling technologies such as tiny cell phones and hand-held computers. But is there a limit to how small electronics can be? In this talk, I will approach this question by discussing the past and future of a key nano-electronic element, the transistor. As transistors approach the atom-scale, their operation is limited by quantum mechanical effects. Thus, radically new technologies will be needed to overcome this fundamental physical limit. I will discuss the science and research behind some new approaches, including using novel nanomaterials and quantum computation. Popular lecture. To date, extrasolar-planet searches have found 3,501 planets that orbit other stars. One exciting goal of these projects is to find a planet that orbits within the "habitable zone" of its star and is sufficiently Earth-like to (perhaps) sustain life. 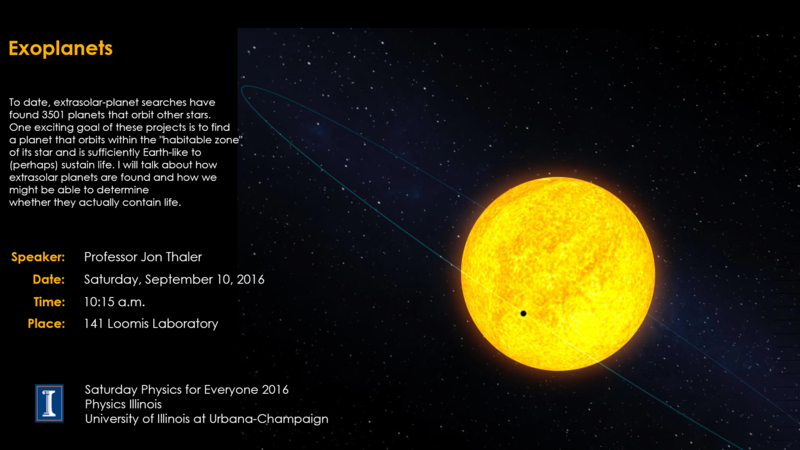 I will talk about how extrasolar planets are found and how we might be able to determine whether they actually contain life. The amazing sight of superfluid helium dripping through a solid container and of a magnet floating peacefully above a superconductor are macroscopic manifestations of essentially quantum phenomena. While we understand many aspects of these exotic phenomena, important questions, such as the microscopic mechanism of high-temperature superconductivity, still remain unanswered. Not only will solving these puzzles enrich our understanding of fundamental physics, it will also lead to tremendous advances in decreasing our energy consumption, which in turn will have a direct impact on greenhouse emissions. But how do we obtain the necessary microscopic information on the quantum properties of electrons in solids? A critical component to this is the ability to directly "see" the behavior of matter on the scale of atoms and electrons. In this talk, I will describe the miracle of the modern scanning tunneling microscope, which actually uses quantum mechanics for its basic operation. I will describe how we can use this quantum microscope to probe and manipulate atoms and electrons and how this powerful tool can be used to obtain microscopic quantum information on many materials, including high-temperature superconductors. Saturday Physics for Everyone: What can theoretical physics tell us about the evolution of early life? Life on Earth is wonderfully diverse, with a multitude of life forms, structures, and evolutionary mechanisms. However, there are two aspects of life that are universal—shared by all known organisms. These are the genetic code, which governs how DNA is converted into the proteins making up your body, and the unexpected left-handedness of the amino acids in your body. One would expect that your amino acids were a mixture of left- and right-handed molecules, but none are right-handed! In this talk, I describe how these universal aspects of biology can be understood as arising from evolution, but generalized to an era where genes, species, and individuality had not yet emerged. Lastly, I will describe experimental work, conducted in collaboration with Tom Kuhlman, that probes the mechanisms of evolution at the molecular level, in real time, in living cells. These experiments complement the theoretical work and can test some of the fundamental assumptions of the theory of evolution. The discovery of gravitational waves from a binary black hole system by the LIGO Scientific Collaboration is a milestone in the history of science. In the next few years, the LIGO detectors will continue to increase their sensitivity, and the worldwide network of gravitational wave detectors will expand to Europe, Japan, and India. We will then be in a unique position to study in detail the properties of ultra compact objects that do not emit light and to follow up those that have electromagnetic counterparts. 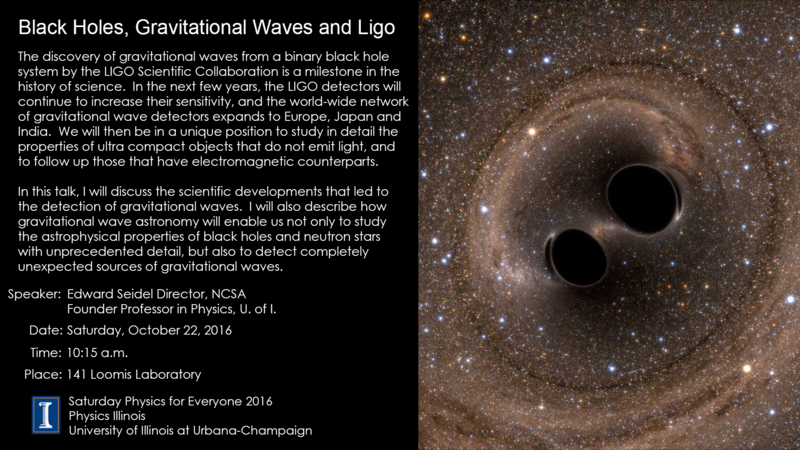 In this talk, I will discuss the scientific developments that led to the detection of gravitational waves. I will also describe how gravitational wave astronomy will enable us not only to study the astrophysical properties of black holes and neutron stars with unprecedented detail, but also to detect completely unexpected sources of gravitational waves. Over the past several decades astronomers have been driven to a remarkable conclusion: the objects we see through our telescopes form only the tiniest portion of the stuff of our Universe. The vast majority of our Universe is in unseen forms, different from anything we know from the laboratory. Galaxies and galaxy clusters are held together by the gravitational pull of invisible clouds of dark matter, while a mysterious force called “dark energy” drives the Universe to expand ever faster. We will discuss how scientists have come to these remarkable conclusions, and the ongoing search to understand the nature of these components. Saturday Physics for Everyone: Visit to the Large Hadron Collider (LHC) where the Higgs Boson was Found. Come on a virtual tour of the famous LHC accelerator in Geneva, Switzerland. Visit the experiments that found the famous Higgs Boson with Professor Verena Martinez Outschoorn. Prof. Martinez has been on the team that built the formidable particle detectors and developed tools for looking at the data. You may also like Saturday Engineering for Everyone offered in the spring semester. Be sure to sign up for an NCSA tour "Artful 3D animations of scientific phenomena" offered all year long.